By default Google Chrome can complete URLs and searches that you type in the address bar of the browser. This is done using prediction service in Google Chrome. This feature is also available on Google Search website and we have already seen procedure to disable auto suggest on Google website. It was also introduced on search box appearing on Youtube providing auto suggestions as you type. If you do not like auto URL completion feature in Google Chrome you can easily stop this by disabling prediction services and auto-fill options. 1. Open Google Chrome Settings page (chrome://settings/) by clicking dash button at upper right and then click Settings option. Scroll to bottom of ‘Settings’ page and click Show Advanced Settings option. 2. Then under Privacy section, uncheck “Use a prediction service to help complete searches and URLs typed in the address bar” option. This should stop automatic completion of URLs in Google Chrome address bar. 3. 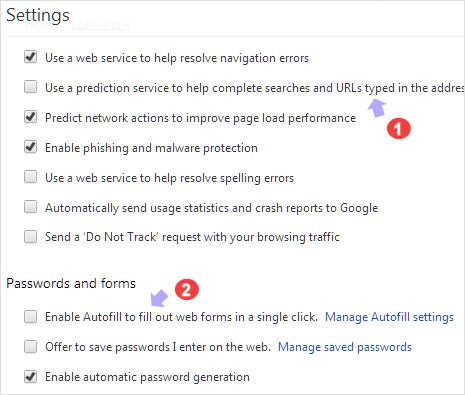 To prevent automatic completion of data entering while filling online web forms like email address login, you need to disable auto-fill option in Chrome. Click to uncheck “Enable Auto-fill to fill out web forms in a single click” option. After making these change, it is recommended to clear Google Chrome history files. Press Ctrl + Shift + Del keys to bring up “Clear Browsing Data” window. Then select types of history files you want to delete and hit the Clear Browsing Data button.